Comments: While not as sought after as the Humanoid figure, the S.T.A.R. 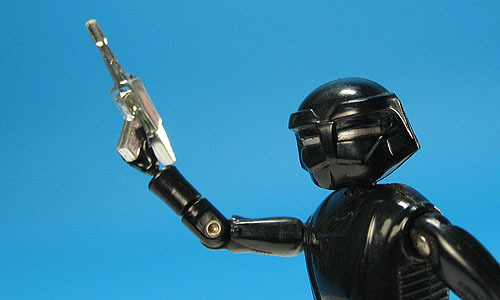 figure was part of the second wave of MEGO's Black Hole action figure line and is also one of the rarest action figures ever produced. While the Disney film the toy line was based on was well received, there was not a solid support with American retailers for MEGO to distribute a second wave. Only toy buyers in Canada and Italy showed support to the collection, and as such these are the only two countries to receive the wave. The Canadian version was packaged on a card similar to the first series available in North America while the Italian version was on a card that featured altered art with the film's human cast under the Cygnus. The S.T.A.R. figure utilized the exact same mould as the domestically released Sentry Robot figure. For the most part, minus the colour of plastic injected in the mould and a very minor spray op alteration, both figures are identical. While both figures feature two fuctional holsters, neither were released with two weapons.